In Traveling Blues, we have stated that violinist James Boucher joined the Sam Wooding Orchestra before going to Sweden in 1925. The identity of this musician could not be 100% verified prior to the printing of the book. Recent information has now showed that the violinist joining Wooding in Sweden and Denmark indeed was James Boucher. 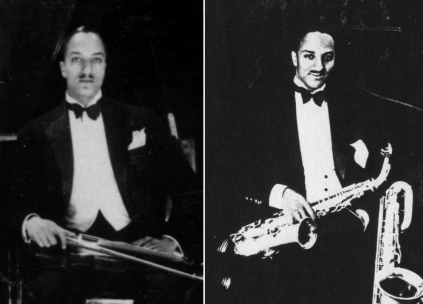 Violinist, clarinetist and alto sax player James "Jimmy" Boucher’s mother was Nanette Horton Boucher, daughter of Surgeon-Major James Africanus Beale Horton of Freetown, Sierra Leone. Africanus Horton had qualified in medicine after studying at King's College, London, and at Edinburgh University. Africanus Horton was a Krio (Creole), stemming from the Igbo ethnic group. His daughter Nanette Horton married William Henry Boucher. Nanette and William Henry settled in London and they had three children: Madeleine, born in Sierra Leone in 1900, Jimmy, born in London sometime between 1900 and 1906, and Enid, born 1906. James Boucher thus was an English citizen and rather light-skinned. Jimmy Boucher became a professional musician as a member of the legendary Southern Syncopated Orchestra touring England in 1919-1921. This orchestra, originally formed in U.S.A.by Will Marion Cook, comprised 27 musicians and a choir of 19. The most renowned of these musicians was Sidney Bechet. James Boucher played all over Europe during the 1920s and in Paris in 1930. There are two photos of the Wooding Orchestra showing a violinist. One photo was shot in Berlin or Hamburg and the other in Stockholm. Newly found pictures of James Boucher from his Paris engagements around 1929 clearly show that the violinist shown with Wooding in 1925 was Boucher.